Grab your Japanese milk loaf only at RM1.80 from En Ginza Cafe! This voucher is valid with any purchase. 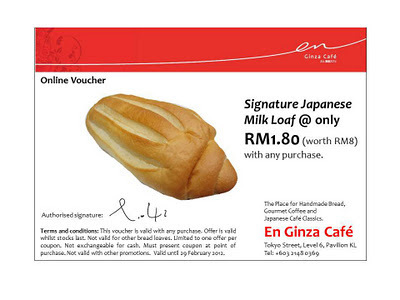 Not valid for other bread loaves. Among their major products are freshly baked French breads, gourmet coffee, pastries, cakes and cafe menu.